RM Sotheby’s is kicking off its 2019 season with a two-day sale (Thursday 17th and Friday 18th January) at the Arizona Biltmore in Phoenix (AZ). The lots will be previewed on Wednesday 16th, from 10 a.m. to 8 p.m., and also on the two days of the sale itself, from 10 a.m. up to the start of the bidding, which will get under way at 5.30 p.m. on both days. Payments of up to USD 250 K will be subject to commission of 12%, while the rate for any amounts paid beyond this threshold will be 10%. The 153 car lots (as well as the automobilia lots, some pedal cars, a tractor and a caravan) will be divided evenly over the two days, with 77 being offered on the first day and 76 on the second. A considerable proportion of the lots (57%, meaning 88 cars), will be offered without a reserve price, meaning that they will surely be sold. Among the cars offered for sale, 13 have been assigned estimates that break the million dollar barrier. Specifically, one is expected to fetch at least USD 11 million, one USD 6 million, and another USD 3 million, while there are four cars with lower estimates of USD 2 million, and six that are each expected to sell for at least USD 1 million. The car with the lowest estimated value (USD 15–25 K), one of the many offered without reserve, will be first lot offered on the second day of sale. It is a 1974 Volkswagen Type 181, a model that is referred to by a variety of names (Thing, Pescaccia, Trekker, Safari, Kurierwagen), depending on the market on which the car was originally sold. This particular example (chassis #1842322047) comes from the Torque collection and features an “outlaw” preparation. At the other end of the spectrum, the auction’s highest estimated value (USD 11–13 million) has been assigned to a 1957 Ferrari 250 GT Pinin Farina Speciale. The youngest cars up for sale, both from 2018, are a Porsche 911 GT2 RS “Weissach” (chassis #WP0AE2A95JS85392), which has done just 55 miles, and a Porsche 911 Turbo S Exclusive (chassis #WP0AD2A9XJS156764), one of the only 500 built, which has covered 50 miles. What makes a car collectible? Old cars can boast numerous features that generate appeal and increase their value, such as technical superiority and rarity, an interesting provenance or history, being a coveted brand, having had an important first owner, and so on. The more of these boxes they tick, the greater the level of interest they will attract and the more valuable and historically important they will be considered to be. 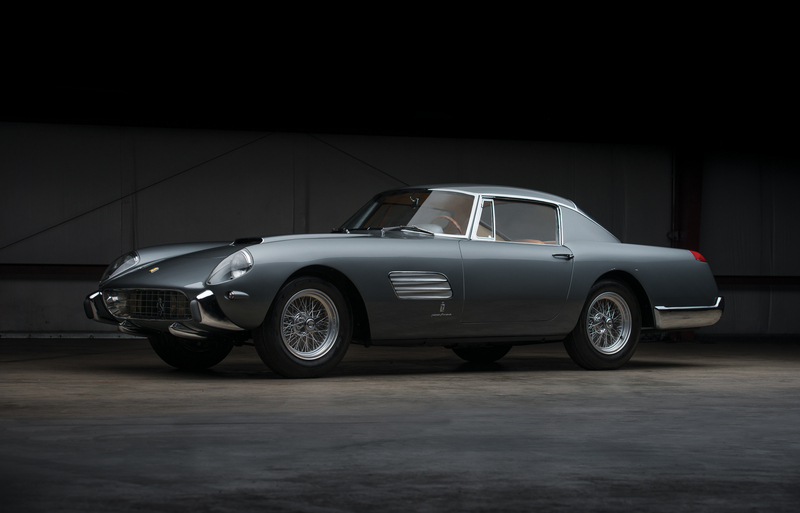 All this makes it easy to understand why this Ferrari 250 GT Coupe Speciale by Pinin Farina being offered by RM Sotheby’s has been assigned such an incredible estimate (USD 11–13 million): the car ticks all the boxes and offers even more besides. Chassis #0751, with its matching numbers engine, is based on the 250 GT mechanics, which are among the most acclaimed ever produced by Ferrari, coupled with the three-liter V12 engine that helped create the whole Ferrari legend. It was in early September 1957 when the car’s type 508 C chassis arrived at Pinin Farina’s workshop, and the coachbuilder lost no time crafting a distinctive, one-off body for it, drawing on several designs that Ferrari already had (albeit sketched by Pinin Farina’s competitors), as well as other, new ones that heralded the forthcoming series-built Pinin Farina coupe. The long nose of the 250 GT Coupe Speciale had covered headlamps like those of the 250 GT Tour de France racing Berlinettas of the time, while the front fenders were notable for their large chromed and louvered vents, reminiscent of those found on the California Spider. Furthermore, the bumperettes, nose and hood scoop treatments all borrowed touches from the recently released Series I cabriolets. Finished in Max Mayer’s Grigio Fumo (Smoky Gray) and trimmed with natural Connolly Vaumol leather, the one-off coupe was delivered to her first owner, Lilian, Princess of Réthy, at her Waterloo home in January 1958, and registered with Belgian diplomatic plates. Lilian, who married King Leopold III of Belgium in 1941, was a sports and racing car enthusiast who, in the post-war years, became an avid Ferrari customer and a personal friend of Enzo. She was a passionate driver who loved her Ferraris. Over her lifetime, she owned, among others, three one-off examples, #0751 being the second. She also earned Ferrari’s deep gratitude following the occasion, during the 1955 racing season, when Pirelli suddenly withdrew from competitive racing, leaving Ferrari without tires and without Pirelli’s sponsorship money. A potential crisis was averted when Lilian stepped in, quickly approaching the Belgian tire company Englebert, which, the very same night, began sending fresh rubber supplies to Maranello. About 10 years later, the princess ordered her third coachbuilt Ferrari, and as a consequence started looking for a worthy new home for her 250 GT Speciale. American surgeon Michael De Bakey and his brother Ernest, both Ferrari enthusiasts, met Lilian at a charitable event organized in support of cardiovascular specialty hospital. There, the Princess insisted that Dr Ernest De Bakey accept the 250 GT Coupe Speciale from her as a gift. Despite Dr De Bakey’s attempt to politely refuse the gift, on his return home to Mobile, Alabama, he found a bill of lading waiting for him. The Ferrari duly arrived at the end of 1967, and was unloaded at the Port of New Orleans from the freighter Witmarsum, as shown by a period photograph. In 1968, De Bakey sold the car to a colleague, Dr John Ochsner of New Orleans, who modified it, installing disc brakes and 15-inch wheels. From 1970 to 1977 the 250 GT Speciale passed through the hands of a long list of American owners, during which time it was dismantled in readiness for restoration, although the work was never actually undertaken. Finally, the car’s fortunes were turned around thanks to the intervention of Ford Motor Company executive John Wilson Clinard of Farmington Hills, Michigan, who restored, repainted and reupholstered it, fixed its engine, and made it roadworthy once again. What is more, Clinard also set about researching the history of the car, contacting the previous owners and putting together the now crucially important documentation regarding its early years. Another series of owners followed between 1984 and 1997, during which time the car was returned to Belgium, where it was sold to Philippe Lancksweert, a former partner of Jacques Swaters at the Garage Francorchamps, who commissioned Italian restorers Bacchelli & Villa to conduct a full cosmetic restoration, including a high-quality refinish in Grigio Metallizzato (metallic gray) paint, as well as restore the interior in beige leather. Meanwhile Autofficina SAURO of Bologna was commissioned to perform much of the mechanical refurbishment. Following the completion of this work, in May 1997 the Speciale was presented at Ferrari’s 50th Anniversary meetings in Rome and Maranello, before being sold to dealer and enthusiast Todd Morici of New Jersey, who showed it at the Cavallino Classic in January 1998. Shortly afterwards, Morici sold the car to its current American owner, who presented it in the Pininfarina class at the 2001 Pebble Beach Concours d’Elegance, before opting to keep it largely out of sight. All in all, a car with a pretty amazing history! At the Classic Car Trust, we don’t usually include two cars of the same brand in the same preview, as our policy is to try and give as many readers as possible the opportunity to find something to suit their tastes. Sometimes, however, we find we simply have to break this rule. On this occasion we feel justified in doing so in order to be able to include this truly lovely Ferrari Daytona NART, which also boasts a wonderful history and therefore deserves to be listed. It belongs to a run of just five cars that were created by Giovanni Michelotti (one of Italy’s most gifted sports car designers) and individually built, based on the mechanics of the Ferrari Daytona Spyder, following a special request from Luigi Chinetti, the legendary Ferrari importer on the American market. The first of these cars was commissioned in 1974 and presented at the Turin Motor Show sporting a Targa top. The second (chassis #15965), commissioned in 1975, was a competition version and raced in the 1975 24 Hours of Le Mans, in Chinetti’s NART colors of course. The final three were all commissioned in 1976 as road legal cars. The car offered for sale on this occasion is the first of these three (chassis #14299, engine B 1036). It was originally manufactured, in 1971, as a “normal” 365 GTB/4 Daytona Coupe for the American market, complete with A/C and power windows, and finished in Grigio Ferro (Iron Gray) over Rosso Vaumol leather. In 1971, Chinetti sold it to a customer who used it for a few years, before returning it in 1976. At this point, Michelotti re-bodied #14299 in the style of the 1974 Turin show car, albeit with less prominent cut-down doors and vent windows; it was also fitted with five-spoke alloy wheels and a tan soft top, and painted in a two-tone color scheme of dark blue over gray. The interior was re-trimmed in orange-hued leather, while the dashboard layout was re-configured using the car’s original Veglia Borletti gauges. As a final finishing touch, a color-matched hardtop was fitted. In early 1977, the car was delivered to Chinetti, who added the script “Marion” on the door, in honor of his wife, for whom the car was a gift. Three years later Chinetti loaned the Daytona to Michelotti to appear on the designer’s stand at the 1980 Turin Motor Show. It then went on display at the Le Mans Museum in France, where it remained until 1982. In 1985, after the death of Mrs Chinetti, the 365 GTB/4 returned to the United States, where it was sold to Los Angeles-based dealer Marty Yacobian and presented at the 1986 Palm Springs Concours d’Elegance. 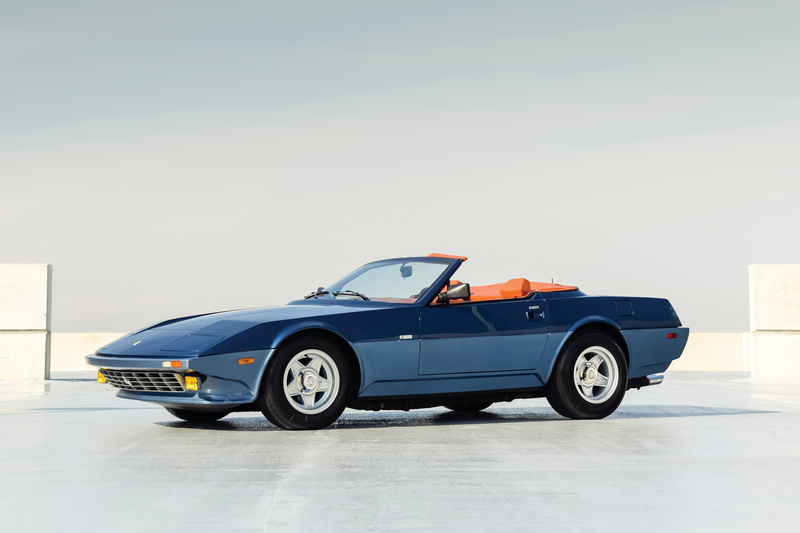 Two American owners later, the car was sold, in September 1991, to the highly respected collector Jon Shirley, who kept it for the next 22 years and had it certified by Ferrari Classiche, which assigned it its attestation for vehicles of historic interest. Purchased by the consignor in August 2013, it was presented at the 2014 Cavallino Classic, where it won an award for Design Distinction, and also appeared at the Amelia Island Concours. Always kept in magnificent condition, and still displaying the mere 5,479 miles it has clocked up since the 1976 rebuild, it is now estimated to be worth in the region of USD 600–650 K.
Lexus, an acronym of Luxury EXportation United States, is the luxury brand of Toyota. It is still quite young, having being founded in 1989. Indeed, it is barely 30 years old, the age limit applied by FIVA for recognizing cars as classics. Accordingly, with 2019 still young, it is only the very oldest Lexus cars than can be considered true classics. Although their main focus is the large-scale sale of (mostly) family cars, some years ago the managers of Toyota Lexus asked Italian designer Leonardo Fioravanti to re-shape the line of their coupe, which they then named LFA in his honor. 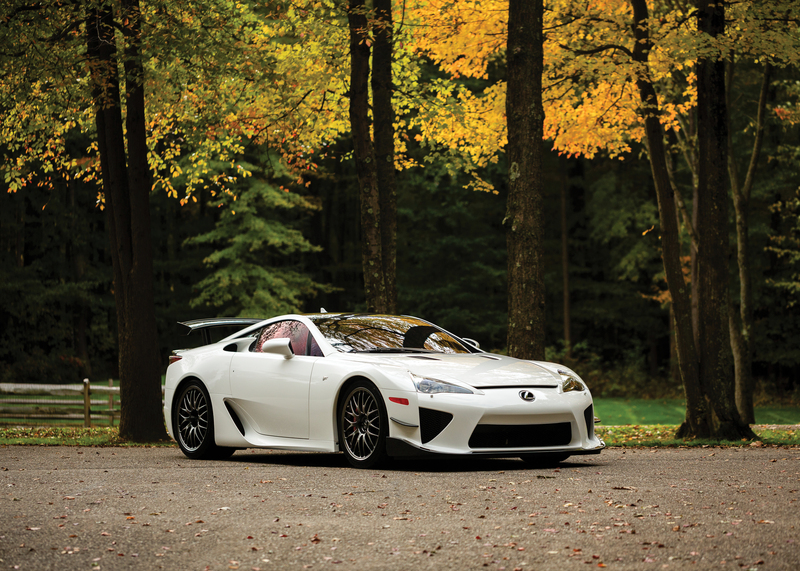 Lexus premiered the new LFA at the Tokyo Motor Show in October 2009. The car was equipped with a 4.8-liter Formula 1-derived V10 engine developed in collaboration with Yamaha, capable of delivering 553 HP, and sported an exclusive carbon fiber reinforced polymer (CFRP) body. It was offered for sale, as a 2010 model year car, with a basic price of USD 375,000. This made it the most expensive Japanese production car ever offered on the market. In 2012, the final year of production, it was joined by a circuit tuned variant, the Nürburgring Package, designed to celebrate Lexus recording three victories in a row at the Nürburgring 24 Hours. Visually, this new version stands out for a number of carbon fiber exterior components, including a revised front splitter, a fixed rear wing, and winglets on the nose. To compensate for the reduced aerodynamics due to the added downforce, the engineers managed to coax an additional 10 horsepower out of the engine, taking its total output to 562 HP. This modification was combined with a faster and revised six-speed auto-clutch manual transmission and magnesium BBS wheels, while the ride height was reduced by 1 centimeter to further improve the car’s handling and to lower its center of gravity. Only 500 LFAs were built in total, which is nothing compared to the million units usually manufactured by Japanese car companies, and the LFA accordingly became an instant classic, the dream of every Japanese car collector. The car offered (chassis #JTHHX8BH8C1000485, serial number 488/500) is one of the only 50 Nürburgring Package cars ever built and it is in as new condition, having covered a mere 54 miles from new. Painted in white (one of the only four colors originally available for this model), with a two-tone red and white leather interior, this US-delivery example (one of the only 15), completely original, is offered with an estimate of USD 0.85 –1.1 million. 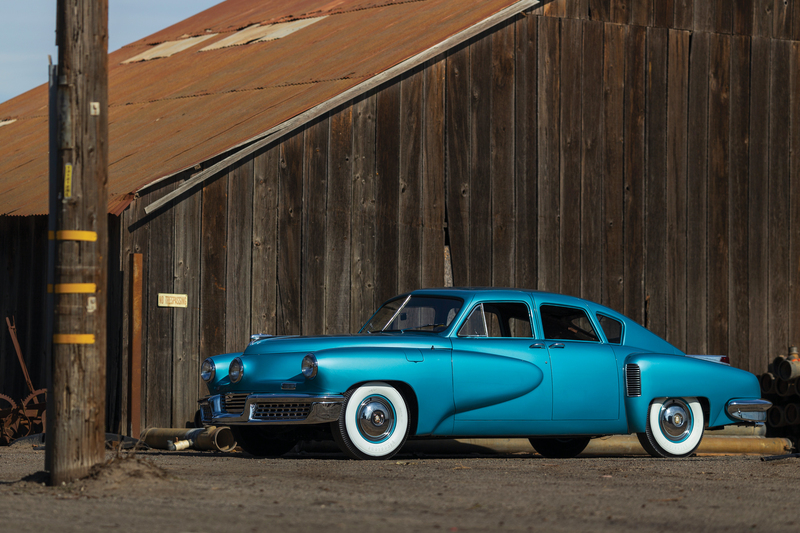 The 1948 Tucker, probably the world’s most revered and collected automotive failure, is one of the most iconic cars ever built. The story of the company’s founder, Preston Tucker, was so remarkable that Hollywood dedicated a wonderful (and successful) movie to him and his (unsuccessful) car company. In all, Tucker’s company manufactured just 51 cars in a disused B-29 plant in Chicago. Practically all of these remained pre-production cars because the planned series production never got under way, and 22 of them, amazingly almost all still surviving, were used in the making of the movie. The model featured a rear-positioned six-cylinder engine, designed by Miller, fully independent suspension, and some safety features in the cockpit in case of accidents. Overall, the concept was revolutionary, and it moved the static American car industry forward by a good couple of decades. The freshly restored, well documented car being offered by RM Sotheby’s (chassis #1040, with engine 33579) is the 40th car built. Originally painted beige, it was sold at the firm’s bankruptcy auction in October 1950. It was one of the 25 cars sold on that occasion, only eight of which, including #1040, had been completed. This car is believed to be one of two purchased by a Mr John Hansen and, in 1955, advertised for sale by a certain R.J. Turner of Minneapolis, with an asking price of $3,900. A Mr Edward Bates of Minneapolis purchased #1040 in 1957, possibly from Turner, and in 1959 it was on display, by this time painted white, at an “Auto-Rama” in Ohio, in the ownership of Russell Strauch. At this point in its life, #1040 had covered just 7,000 miles. After Strauch’s death in 1976, his heirs sold the car to Thomas E. Storms of Los Angeles, who in turn sold it, in 1984, to its current owner. During the complete restoration performed in 1985 by Tucker specialist Russ Brownell, several problems were discovered with the original engine (no. 33543), which was therefore replaced with no. 33579, an unused factory spare acquired from the Harrah Collection. Having been restored again in more recent times, it is now finished in attractive Waltz Blue, a factory color whose name, chosen by Tucker, was inspired by his wife Vera’s favorite dress. It is offered for sale with an estimate of USD 1.5–1.7 million. Few America cars have attained iconic status to the point that they are considered part of the country’s history, but the Chevrolet Corvette, a model introduced in June 1953, which came to epitomize the American-built sports car, is certainly one such car. Funnily enough, in some ways the Corvette can be said to have come about by accident. It was first introduced as one of the GM Motorama Dream Cars, and, given the amazing level of interest and success it achieved, was quickly put in production with a body built in fiberglass, so as to avoid the lengthy process of preparing the press and the tooling for a normal steel body. Although considered production models, each of the 300 cars built in 1953, all finished in Polo White with red interiors and a black soft top, were essentially handcrafted. The powertrain of these first “Vettes” was quite simple, a 150-HP “Blue Flame Six”, and it was available paired with an automatic or a manual transmission. The car offered (chassis #E53F001087) is the 87th built during this first year. Equipped with three side draft carburetors and a two-speed Powerglide automatic transmission, it was originally purchased by Gerald Wiles of Orrville, Ohio, who kept the car for a number of years, at one point changing the exterior color to black. Admired from afar, it was acquired in 1962 by another resident of Orrville, Ohio, twenty-year-old Lyle Hill, who was careful to use the car only in nice weather. In 1968, as a member of the National Guard, Hill was assigned to a base in Germany. He did not know how long he would be away and so, prior to leaving, disassembled his beloved Corvette, not wanting anyone to drive it in his absence. Following his return home in 1970, Hill got married, got a college degree and started to focus on his career, leaving the Corvette in storage. In the 1980s he began buying up parts for 1953–1957 Corvettes through estate sales, advertisements and swap meets, and selling parts throughout the USA, Europe, South America and Asia, becoming a well-known Corvette guy in the process. With 2003 and the 50th anniversary of the Corvette on the horizon, Hill decided to make this date his deadline for completing the restoration of #E53F001087, but unfortunately he did not manage to complete the restoration of the drivetrain in time. Despite this, he was proudly in attendance with no. 087 at the Club reunion. To add to his pleasure, it was unanimously agreed by the officials that there existed no other known 1953 Corvette with a lower original mileage. Mr Hill owned the car until his death in 2014, when it was bought by the current owner, who went on to complete the restoration to NCRS standards. Less than one year later, in 2015, the car was appraised by the Bonneville Chapter of the National Corvette Restorers Association and received the chapter’s Top Flight award. 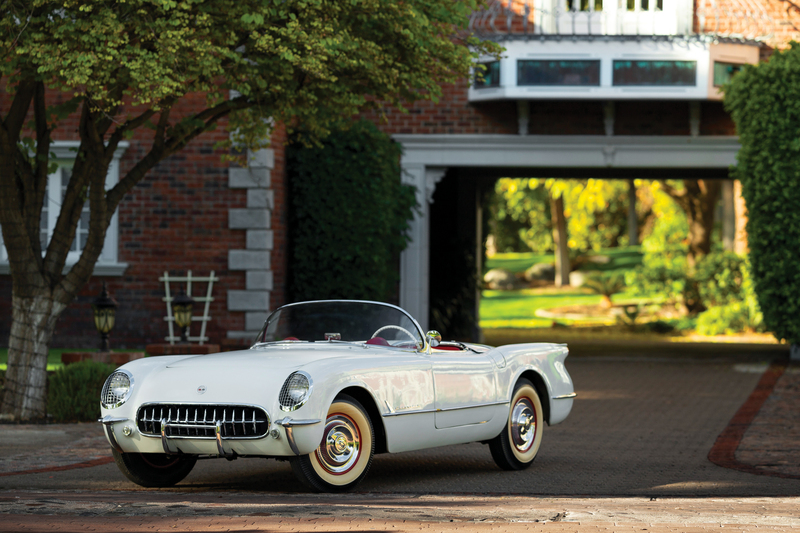 Still with less than 6,000 miles from new, this car is possibly the lowest mileage 1953 Corvette in existence. It is offered for sale with an estimate of USD 225–275 K.
After the Second World War, a fair number of young British (but not only) gentlemen decided that one of the best ways to restore some normality to life was through racing cars. In 1953, AC Cars of Thames Ditton, England, launched its Ace model at the London Motor Show. The Ace was a sports car with a tubular designed chassis, created by John Tojeiro, equipped with a 2-liter Welleter-designed, six-cylinder engine, a fixed-head version of which (known as the Aceca) was unveiled in 1954. The aluminum block engine, which came from Bristol, was made available soon afterwards, and, to underline the presence of this unit and the 125 HP it provided, the word Bristol was added to the name of the cars using it. 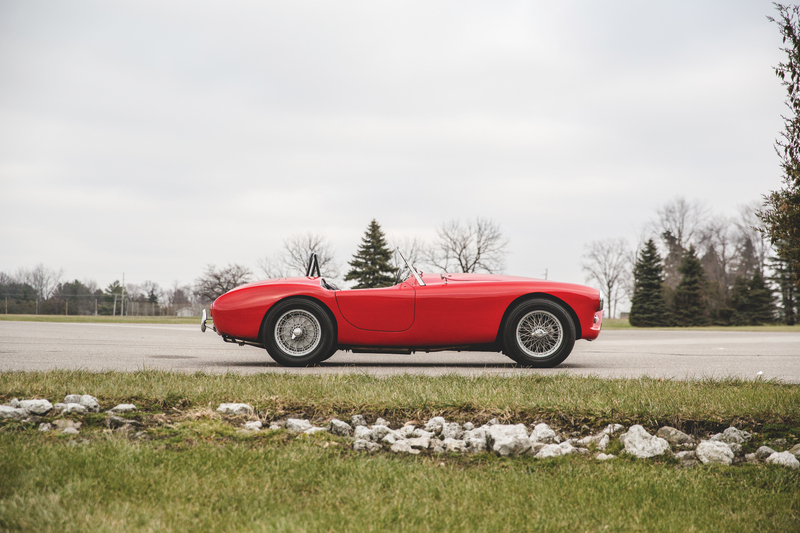 Between 1954 and 1963, AC hand-built just 686 Ace Bristols, but the model took its place in history as it provided the basis of what would become Carroll Shelby’s Cobra. The 1959 car offered on this occasion (chassis #BEX 1087), never restored but always meticulously maintained by race specialists, was originally delivered in the USA painted in red and purchased by Rod de Ronge, who used it to campaign in the early 1960s in local SCCA and club events. As stated in the original bill of sale, this Ace Bristol was delivered with highly desirable front disc brakes, while special features installed by de Ronge included a stainless steel exhaust, driver’s side roll bar, and AC anti-roll sway bar. In the mid-’60s the car was acquired by Shelby and Nancy Walker of New Hampshire, but never raced and simply maintained. It entered its third, and current, ownership in around 1975. The current owner has kept it as it was, still complete with the racing equipment. Repainted in the original color in 1988, it still has its original black/red leather upholstery, showing a charming patina. Other than the odometer, all gauges are operational and the original 16-inch knock-off wire wheels are in fine condition. The current owner had the suspension and steering system fully rebuilt in 2015, and the original steering box is included with the car along with factory-original velocity stacks and air cleaners. The lot includes a thick portfolio of documents, an original racing screen, a spare wheel, windows, a tonneau and a soft top with frame. The car is offered with an estimate of USD 275–300 K.